You read that right; Audi has unveiled the first road car to be fitted with its Le Mans-winning V12 diesel engine. The Q7 V12 TDI is still officially a concept; Audi revealed the road-going version of its race engine at last year’s Paris motor show and hasn’t confirmed when it will go into production, but it will almost certainly be offered in both the Q7 and the A8. This Q7 concept featuring the engine is designed to get us excited about the new engine (it has) and to highlight Audi’s commitment to selling more diesels in America, which has long rejected them. Just to be clear – this is a racing V12 diesel engine fitted to a big off-roader? Sounds an unlikely combination, but yes. The road version of the V12 diesel has more capacity than the racer at 6.0 litres to 5.5, but its twin turbochargers don’t blow as hard so it produces ‘only’ 500bhp to the Le Mans R10’s 650bhp. And we love four-figure output claims; peak torque is 1000Nm, or 737lb ft. Audi says the concept will hit 60mph in 5.5sec and although it would be limited to 155mph, we noticed the speedo was calibrated to 220mph; that’s probably only 40mph optimistic. This one fails on the first two counts but succeeds on the second; it is fitted with the Bluetec system developed by Mercedes which treats exhaust gases to remove the nitrogen oxides which prevent diesel engines being sold in some US states. 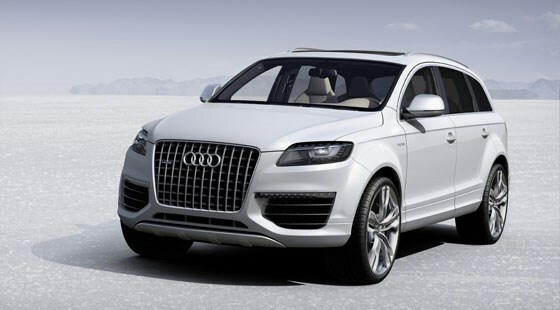 Audi also unveiled its production Q7 3.0-litre TDI with Bluetec, which goes on sale in the US next year. It may be a little bling for most tastes, but the white paintjob looks sensational in the steel, and the new S6-style grille looks really sorts the Q7’s fussy front end out. The massive chromed rims are concept specials, as is the completely ivory interior, but the individual MMI controllers set into the front seat backs might make production.